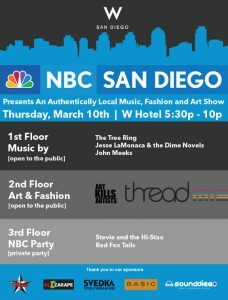 I teamed up once again with Art Kills Artist at The “W” Hotel in downtown San Diego on Thursday, March 10, 2011. Art Kills Artists worked with NBC San Diego and THREAD to put on quite the evening of art and entertainment. There was live music on the 1st and 3rd floors and the art /Fashion happened on the 2nd floor. I displayed paintings and also painted “LIVE” for the evening. Check out the video short on the NBC site!